FC Halifax Town crashed out of the FA Trophy at the first hurdle as they lost 3-2 at home to Matlock in their third qualifying round replay. A first-half brace from Marcus Dinanga gave Matlock a 2-0 half-time lead, which was cut in half by Jake Hibbs just before the hour mark. Matty Kosylo was up to his super sub tricks again as he levelled after coming off the bench, only for Ted Cribley to restore Matlock’s lead five minutes later. Billy Heath said after Saturday’s draw that his team needed to find some confidence, and they looked devoid of it here against a Matlock team who finished the job they almost completed at the weekend. The replay seemed to have given Halifax a second chance of reaching the next round, but it was Matlock who grabbed it with both hands. An indication of Heath’s dissatisfaction at Saturday’s draw was the four changes he made to Halifax’s front six, with only Tom Denton and Josh Macdonald surviving the cull. Liam King, one of the four who came in, dragged his low shot across goal after being played in behind the Matlock defence before Tom Denton headed wide from six yards out, both inside the first 10 minutes. Left-back Jake Green then fired just wide from 20 yards with Tom Nicholson rooted to the spot, but the game wasn’t as thrilling as those chances would suggest, and wasn’t helped by a palpable lack of atmosphere at The Shay. Billy Heath rued a lack of quality from his side on Saturday, and it was the same problem here, with too many passes going astray and a lack of urgency to their play. Matlock hadn’t been much better, but took the lead when Curtis Morrison capitalised on hesitancy at the back by Nathan Hotte before squaring the ball to Dinanga, who slotted the ball across Nicholson from 10 yards. Town’s response to falling behind was negligible, with Matlock’s greater pace and better movement in attack making them the more potent attacking threat. The almost eerie quiet inside The Shay made the groans and yells of frustration from the solely-occupied East Stand all the more audible, all of which was music to Matlock’s ears. 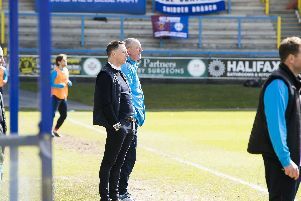 The game was increasingly resembling Saturday’s tie, with Matlock quicker and sharper than The Shaymen, who were struggling badly to assert themselves. And their task was made doubly difficult when the impressive Ted Cribley got the better of Cliff Moyo before his cross was bundled in by Dinanga. An injury to Hotte then led to a competitive debut for Ross Barrows, but it was hardly the ideal scenario for the youngster to be brought into. The more Halifax tried to get a foothold in the game, the worse it seemed to get, with possession repeatedly wasted, while Matlock gleefully chased after every loose pass and stray flick-on. Halifax were booed off at the interval; the contrast from their last home outing against Dagenham and Redbridge couldn’t have been greater. That night two weeks ago Town were incisive, confident and committed. Two weeks is seemingly a long time in football. Fifteen minutes can’t have been long enough for Heath, as whatever was said at half-time had no immediate impact. It wasn’t until the 57th minute that Town finally, finally produced football sharp and skillful enough to break through the Matlock defence when a nice one-two between Hibbs, temporarily moved to right-midfield in place of the off-colour Josh Macdonald, and Richard Peniket led to Hibbs running through on goal and coolly slotting the ball past Phil Barnes. Ten minutes of fairly incident-free action later, and Town were level when Kosylo - hero of that Dagenham win - bundled the ball in on the line after Peniket’s had headed against the bar from a corner. Like on Saturday, Town had clawed their way back without reaching top gear. Denton the volleyed over from eight yards out before the game swung back in Matlock’s favour when Cribley, as good as any player over the two games, got past Barrows on the edge of the area before driving a low left-foot shot across Nicholson into the far corner. Matlock’s time-wasting methods included kicking the ball away and a spot of keepy-uppy’s before taking a throw-in, but it wasn’t really necessary, with Town creating little in the time that remained, and putting up little fight to retain a trophy won in such glorious fashion six months ago. Halifax: Nicholson, Moyo, Garner, Hotte (Barrows 36), Wilde, Macdonald (Sinnott 56), King (Kosylo 65), Hibbs, Simmons, Denton, Peniket. Subs not used: Lynch, Khan. Matlock: Barnes, Marsden, Doyle-Charles, Wiley, McManus, Adam Yates, Williams, Cribley, Morrison, Dinanga. Subs not used: Newsham, Jamie Yates, Pursehouse, Grocott, de Girolamo.